LOM architecture and design has been selected to design a state-of-the-art facility that will be Santander’s new world-class digital hub workplace facility. 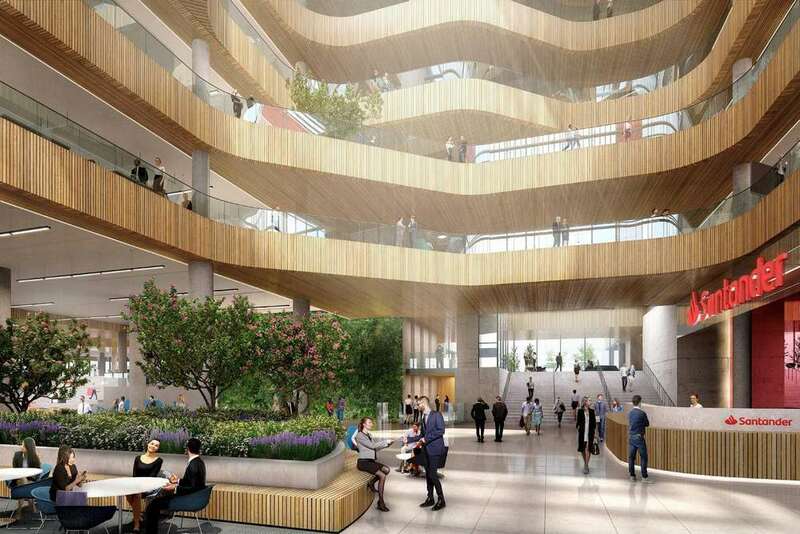 Located in Milton Keynes, the new complex is anticipated to open in 2022, subject to planning, and is expected to accommodate over 5,000 employees. Santander are the leading employer in Central Milton Keynes. The brief called for a workplace campus that would foster an agile, sustainable and innovative workplace for the future, reinforcing Santander’s global reputation as ‘the best bank to work for’. The ground level is conceived as an open, fluid, publicly accessible and flexible space that can be reconfigured and ‘curated’ to suit changing requirements. The design concept proposes a community ‘destination’, where pedestrian activity is enlivened by ‘pop up’ retail units – creating a vibrant and attractive environment for both bank staff and the wider community. The new building will support health and wellbeing, including a fitness centre, cycle storage and a restaurant and café offering healthy food options. The working environment is informed by a biophilic approach – maximising natural light and ventilation to enhance air quality and encourage direct connections with nature. A sequence of three naturally-lit, connecting atria feature imaginatively planted linear gardens. The upper floors of the building offer flexible workspace arranged around these internal atria. The proposed site occupies a prominent position opposite the station square and is immediately visible on arrival into Milton Keynes by train. Nathan Bostock, Chief Executive, Santander UK, comments: “We are excited to be sharing our proposals for this major investment in Milton Keynes, reflecting our long-term commitment to the local area. We want a workplace which truly reflects our culture and our vision for the future, which is based on innovation and harnessing new technology to make banking simpler and more personal for our customers.